Living Stations of the Cross is in 30 minutes! If you're part of the cast, you should be in Mrs. Ricaurte's room getting in costume! The Men's Club is holding a fish fry this Friday, before the Living Stations of the Cross. Come have dinner as a family before the performance! (And if your student needs service hours, the Men's Club could use their help for the fish fry! Contact Danny Bercher for details! Living Stations of the Cross performance is this Friday at 7pm. Arrive before 6pm to eat at the Fish Fry and get into costume! YFF will not have classes on March 17th or 24th for spring break. Classes will resume on March 31st. Don't forget that it's Daylight Savings Time. Remember to spring your clocks forward an hour tonight so you don't miss Mass, your Confirmation interviews, or Stations practice! CYM families, we are in desperate need of readers for the Youth Mass tomorrow. Please do not let the parish down! Text me at 501-681-4792 to step up and participate!! Don't forget practice for the Living Stations of the Cross following the Youth Mass this Sunday! This Sunday, after the 8am Mass, those being confirmed in June will have their interviews with Fr. Nelson. They will be on a first come/first serve basis. Join the Knights for breakfast while you wait! This week's Confirmation class is for the condensed class only. See you from 9:10-10:15! Jr High CYM this Sunday, 5:00pm-6:15pm! 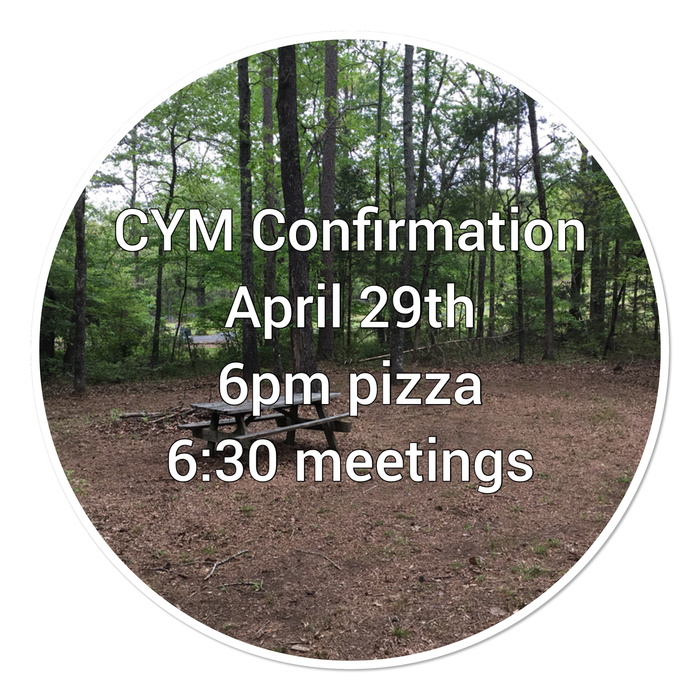 Sr CYM meets this Sunday from 6:30-8:00! Remember the parent Confirmation class this Sunday! There will be no YFF or RCIC classes this Sunday. Have a great President's Day weekend! Nothing says I love you like pancakes! Come out this Sunday after the 8:30 am mass for The Knights of Columbus breakfast. $5 for adults and $3 for children. Students in the Condensed Confirmation class have the Diocesan Confirmation Retreat this Sunday, 10-4! This month's Parent Confirmation class will be on 24 Feb! Sr CYM is cancelled in lieu of the Super Bowl! Enjoy family time of football, food, and fellowship! There are lots of upcoming volunteer opportunities! Check your email for signup links. Your help is much needed and appreciated! Congratulations to the First Communion class that celebrated the sacrament of First Reconciliation this morning! Thank you to Fr. Ruben and everyone who made this possible! Join us for a Eucharistic Procession and Mass for Life in downtown Little Rock this Sunday at 10am! It's a great way to honor LIFE! Congratulations to all our winners during the annual KofC Free-throw Competition! 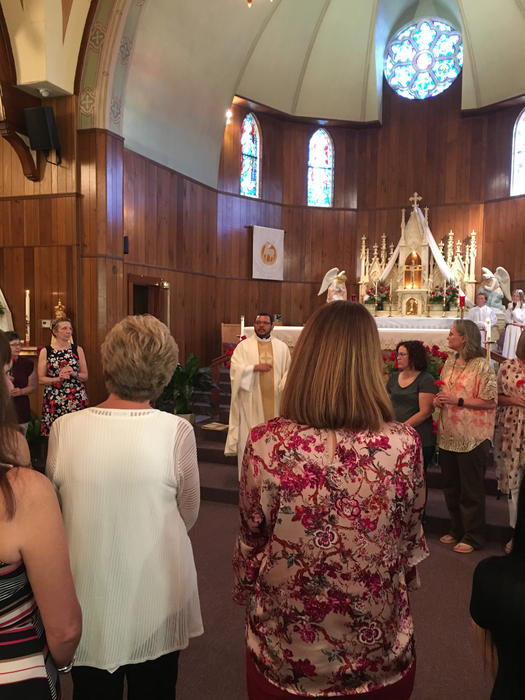 Youth Mass and family luncheon this Sunday! Join us for Mass and making "Good Deed Beads"! This Sunday is the makeup Confirmation class for those who missed the Sunday before Thanksgiving! You only need to attend if you missed that week! Knights of Columbus Free Throw Competition! All boys and girls ages 9 to 14 are invited to participate in the IHM competition for the 2019 Knights of Columbus Free Throw Championship competition on Sunday, January 13th, at the IHM gymnasium. Registration begins at 2:00 p.m. The event will complete by 3:00 p.m. This week's Confirmation class is for students who missed Chapter 6 (the Sunday prior to Thanksgiving). Your child only needs to attend if they missed that week! Tomorrow's parent Confirmation class has been canceled due to illness. Thank you for your understanding! Remember this Sunday is a parent Confirmation class! The first Sr CYM of the new year is this Sunday at 6:30! Join us for dinner and a discussion on Renewal of Self through Resolutions! RSVP through Evite! This weekend was a busy CYM weekend, with our Bingo fundraiser, Christmas Caravan, youth Mass, and luncheon. All events were a success! I'll see everyone in the new year! Merry Christmas and may the peace of Christ be with you all! This Sunday is the Knight’s 2nd annual Breakfast with Santa at the IHM parish life center. Breakfast is $5 for adults and $3 for kids. Don't forget that Ozark Nut Roasters orders are due tomorrow! Help CYM meet their fundraising goals to support our summer activities! Don't forget the Youth Mass at 10:30 this Sunday, followed by lunch and a community service project for Christmas Caravan! RSVP to youthdir@ihmnlr.org!! This Sunday is the Junior High Youth Rally at MSM. No Confirmation class this week! Knights of Columbus November Breakfast ON SUNDAY, NOVEMBER 11, 2018 FROM: 8:45 am UNTIL: 10:30 am Come out for some good food! Join us for Sr CYM on Sunday from 6:30-8pm! Come with a picture or memory of someone from your life that has died as we take a look at the meaning of All Soul's Day. Jr High CYM carves some pumpkins and no one lost fingers. Success! SR CYM this Sunday, 6:30-8! RSVP to youthdir@ihmnlr.org and bring a pumpkin to carve! Jr High CYM this Sunday from 5-6:15! RSVP to youthdir@ihmnlr.org and bring a pumpkin to carve! Parent volunteers needed as well!!! Knights meeting tonight at 6:30 p.m at the Parish Life center. Knights of Columbus breakfast is this Sunday between masses. All profits will be donated to organizations that support children with intellectual disabilities. This week's Confirmation class is a combined class from 9:10- 10:15 on Sunday. Our second youth Mass is on 21 October! Please rsvp to youthdir@ihmnlr.org with how many people will be joining us for lunch and rosary making afterward! Sr CYM this Sun- 6:30-8:00! Join us for nachos and a guest- Monica Weigle! Mrs. Weigle will talk to us about answering God's call and following dreams while helping us grow in understanding interaction with and opening hearts to those who may seem so different to us. Sponsor forms and copies of Sacramental forms (if Sacraments were not at IHM) are due on 14 October! If your sponsor is not from IHM, contact the sponsor's parish about providing documentation of good standing! Candidate Commitment forms for Confirmation are due this Sunday! The form can be found in the blue folder. Attention IHM! We need help moving the Karnawal up to the Parish Life Center. Many hands make light work. Please come up now to IHM and lend a helping hand. Congratulations to Christine Stehl on winning the $100 prize at last nights Karnawal. Come out tonight for another chance to win another $100. We will be in the Spanish Room tonight. Hi, This is Elizabeth Jara, the new Youth Director and Confirmation Director. I'm excited to join the parish and look forward to meeting you all soon! Here comes VBS! Check out what Fr Nelson made! The beginnings of our ship is taking shape. If folks have time today or after mass at 1030 on Sunday to help set up decoration it would be appreciated. Need all hands on deck. Get it ships have decks? Happy Father’s Day from the Knights of Columbus. Thank you for the blessing Father Ruben. Knight at the game was a success! Thanks for everyone for coming out to the game! Congratulations Father Ramos! KofC 11097 knights are so proud of you! Thank you for your service to the KofC and IHM! Good Shepherd Sunday! "My sheep hear my voice; I know them, and they follow me" Jesus wants to stay close to us, and he wants us to stay close to him, close enough so we can always hear his voice. How many Knights does it take to make coffee? JJ and Paul earing the profits! Breakfast is served! Jr High Cym learned all about divine mercy and the divine mercy chaplet. What a great job they did. So proud of them. During the chaplet those that wished to let go of things on their heart could write down them on paper and then tear them up. Spirit is a moving! Father’s weather prayer worked! The rain stayed away! Hey CYM, No CYM meetings till April 8th. Have a great springbreak and Easter! Its Youth Mass time! This weekend is CYM Youth Mass @ 5 pm. Meal is at 6 followed by the Sr High CYM leading the Jr High CYM at the youth house. Going to be a great time!!! Senior High CYM did a great job with the living stations!!! Good job everyone. Hey IHM, Friday Feb 23 the Jr CYM will be performing the Living Stations of the Cross at 7pm. Parents please have the youth there at 6 for our last minute run through. They’ve worked real hard. Hope to see all there. IHM men attended the 2018 Catholic Men’s conference. Guest speaker Bishop Cahill spoke about hearing God’s voice in the noise of the world. Our own Steven Shook helped through his amazing piano. This Sunday January 28th the Knights of Columbus will host its annual Free Throw Competition @ 1:30pm in the IHM Gym. Boys and Girls ages 8-14 can compete against local youth for Free-throw bragging rights! Winners compete at the district level. Come out for a good time and root on our youth! IHM Mardi Gras Family Fun Night Saturday February 10th @ 6 pm You can purchase tickets at next week masses, church office, or by contacting Stacie Burton or Christy Piechocki. If you would like to volunteer text or call Christy at 501-772-1184 or Stacie at 501-366-2578. CYM Youth Mass January 14th at 5pm followed by dinner and Jr, Sr High CYM and Confirmation. Hope to see you there! Happy New Year! Welcome back to CYM. For those in the choir we will meet at 4 at church. Meal starts at 6 pm and meeting at 6:30 pm. Hope to see you there! This DEC 3, CYM is back! Meal at 6 and meeting at 6:30. At all masses this weekend we will be dropping off bags to collect goods for the Xmas Caravan. Be looking for more details in email. Also CYM Band practice Dec 3 at 4 pm. No CYM for the next two Sundays! Have a Great Thanksgiving!!! We made it to Jr CYM Youth Rally! Hey IHM! Here at Formed training training. Get ready for more news! Sunday Nov 12, Sr High CYM will learn about Jesus by exploring His teachings and His relationships. No Jr High CYM meeting unless preregistered for the Jr High CYM Youth Rally at Mt St Mary's. This Sunday for CYM we will have mass at 5 and chili dinner at 6. Thank you for all that attended last night’s family fun night. Pictures will soon follow on the CYM FB page. Here’s a few highlights. Hey CYM! This weekend we will have Breakfast for Dinner. Meal @ 6pm and meeting at 630pm. SrCYM will learn about thoughtful prayer and JRCYM will be helping IHMPTO with Trunk r Treat set up. Hope everyone had a great time last night. REMINDER, SR CYM will be going to the CYM rally this Sunday. If you are not attending the rally there is no SR CYM. Check the app and website for updates. Is this the blind leading the blind? Youth Mass this Sunday at 5 p.m.! Hope to see you all there! Thank you so much for everyone participating tonight at the parents meeting! This is going to be a great year! Our Website can be cool! Hey everyone this is Jeff Burton. I know have a way to send updates for CYM via our website. I hope you like it. So don't delete this text thread!!!!! Have a child in 6-12 grade, come join us this Sunday at the CYM picnic..can't wait to see you there!!! Alleluia! Christ is Risen, He is Risen indeed, Alleluia! I want to THANK YOU for your prayers and extend wishes of a joyful Easter to all who made my first Easter at IHM a memorable one. Blessings! Palm Sunday! Thank you to all the wonderful people who has been decorating our Church. Blessings! Mass has been canceled due to Tornado Warning. Please TAKE SHELTER. Blessings! Our Lady to Juan Diego: "Let not your heart be disturbed...Am I not here, who am your mother? Are you not under my protection? St. Juan Diego, pray for us! Repentance is showing my vulnerability to a vulnerable God. It’s the recognition that I am enormously loved by God, that I have sometimes failed to live up to that love, and that I need his mercy. “Advent is a journey towards horizon of faith.” (Pope Francis) Let's enjoy this journey together. Let's countdown the days until Christmas renewing our hope in the Lord who is coming! “How can I repay the Lord for all the great good done for me?” Being GRATEFUL is the best way to answer to God as his children. Let’s be grateful children to our Lord. Let us make a “thanks list”. Have you checked our Sunday readings? A fruit of a good discernment of the end of times is HOPE, NO fear! All Souls Day is a celebration of HOPE. As we pray for our Beloved ones... we are reminded that our homeland is in Heaven. May the soul of the faithful departed rest in peace. Amen. "Proclaim: the Kingdom of Heaven is at hand...Without cost you have received; without cost you are to give (Mt.10,7-15) How my proclamation of the Kingdom is a sign of my trust in the Lord? Peace! Welcome to IHM Fr. Ruben.